Modern hair transplant procedures use naturally occurring groupings of follicles as individual grafts. These clusters may consist of single hair follicles. Or they may include up to 5-6 hair follicles per follicular unit. In the average Caucasian male, for example, each follicular unit graft tends to have 2.2 hair follicles. More follicles per grouping will logically increase the diameter and the wideness of follicular units for fuller hair transplant coverage. Most FUE punches are extremely small, in the range of 1mm or less in diameter. Therefore, harvesting bigger grafts will require using a larger punch size. The Dr.UGraft ™ suite of hair transplant devices includes features that expand the reach of the punch to safely encompass wider follicular units. Using follicular unit hair transplant grafts creates more natural looking end results. Within each cluster, the individual hairs are naturally very close to one another. This property allows them to create a fuller look in the end. The choice to redistribute naturally occurring follicular units will give rise to more undetectable looking outcomes. Follicular units can include several strands of hair – extracting multiple hairs in one follicle is not uncommon in hair transplant surgery. However, the transection rate can increase with the width of follicular units, as many punch tools struggle to encompass the entire unit. Conventional FUE practitioners use larger diameter punch sizes to extract wider follicular units. Applying a smaller punch to a larger sized graft runs the risk of injuring it the outer, protective collagen tissue sheath. At worst, it can even cut straight through the graft. Each follicular unit has its own anatomical structure. They consist of the individual follicles as well as blood vessels, nerves and a tiny muscle known as the erector pilorum. When these structures are injured during the extraction process, this will greatly lower their chances of growth and survival. It may seem that a larger punch diameter is a safer choice for surrounding wider follicular units. However, increasing the punch diameter size will incur bigger wounds. This makes it more challenging for the donor skin surface to heal with cosmetically acceptable results, compared to smaller wounds. Dr.UGraft ™ rotary punches are designed with a flared, hybrid end. This acts as a built-in safety mechanism to help avoid injuring the graft. Deep within the skin, flaring extends the reach of the punch beyond its diameter. It also directs the sharp cutting edge away from the follicular unit. At the same time, the actual part of the punch which actually touches the graft is a dull, curved surface. Together, the sharp and dull aspects create a hybrid punch. As these devices rotate, the flared component creates a vortex force that gathers a greater amount of tissue beyond the physical diameter of the tip/edge. This results in bulkier grafts which are able to survive much better, compared to slimmer graft with less tissue. 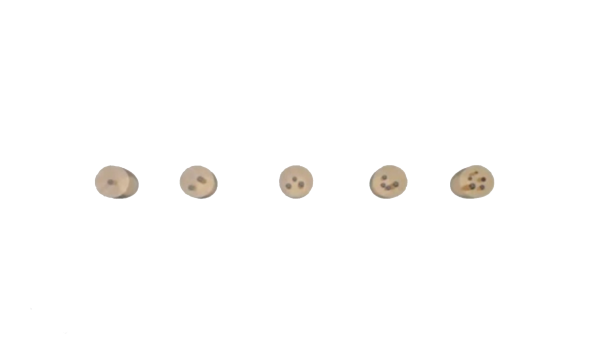 The diameter of the Dr.UPunch i ™ and the Dr.UPunch Smart™ stays consistent. This means that the flared punch tip is no wider than the rest of the device’s body. less everted than is found with traditional edged in FUE punches. Less everted wounds have a better healing profile. Thus, these small wounds typically heal smaller and flatter than the wounds created by conventional punches. In addition to the flaring, Dr.UPunch i ™ (The intelligent Punch) is also designed with an expanded inner volume. The bigger cavity size provides more room for wider follicular units. 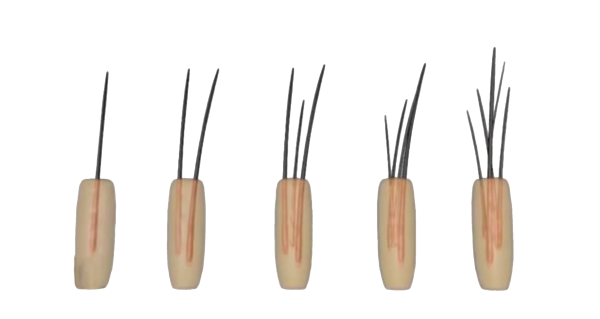 Dr.UGraft rotary devices are engineered to pull the grafts upward into the lumen as they are being scored. Also, a larger space prevents the follicles from experiencing close contact with the inner punch lining. This avoids issues like frictional heat which further damages the graft. Conventional linear scar free practitioners have long relied on different punch diameter sizes, depending on how wide the follicular units are. However, Dr.UGraft punches with comparative diameters can safely surround grafts with multiple follicles. The animated video below shows what happens when a regular punch is used on a double haired follicular unit. It also depicts the use of a Dr.UGraft punch on the same graft size. 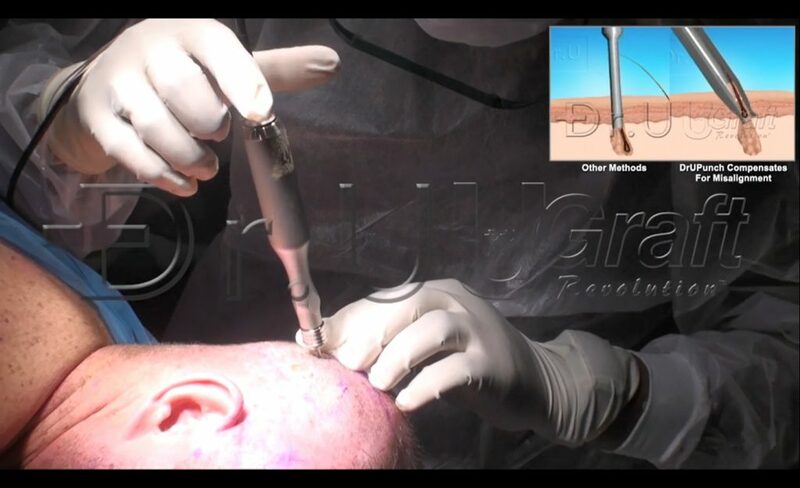 The Dr.UGraft device is designed for successfully extracting multiple hairs in one follicle. The wide follicular unit hair transplantation video below shows the Dr.UGraft system in action during a live surgery. Dr.UGraft ™ devices are engineered to solve key FUE problems and challenges. With the flared hybrid tip and the expanded volume, practitioners can easily overcome the challenge of wideness of follicular units for fuller hair transplant coverage. If you are considering becoming a Dr.UGraft™ provider, click here to learn more. What sized punches are typically used for performing minimally invasive hair restoration procedures, especially for extracting multiple hairs in one follicle? FUE punch diameter sizes usually range from 0.6m to 1.2mm. Most Follicular Unit Extraction practitioners have a variety of different punch sizes during their surgeries in order to safely harvest the different sizes of follicular units available on the patient’s scalp. For example, a 0.75 mm punch can safely remove a single haired follicular unit. But for grafts with 3-4 hairs, 0.9 mm would be a much better choice for handling the wideness of follicular units for fuller hair transplant coverage. However, the downside of using bigger punches is producing larger wounds. This increases the chance of incurring more visible forms of scarring compared to punches with smaller diameters. Which Dr.UGraft ™ devices have the punch flaring for single or wide follicular unit hair transplant? All Dr.UGraft ™ rotary punches, including Dr.UPunch i ™, The DrUPunch Smart ™ and Dr. UPunch Brute ™ are designed with flared ends. This configuration provides greater safety for different-sized grafts during extractions. Surgeons can safely harvest a greater number of follicles with a Dr.UGraft ™ rotary device, compared to a general punch of the same size.